I always like to wear a beautiful coat to the ANZAC dawn service. I feel like ANZAC Day so frequently marks the “turn in the season” when we have to say goodbye to Summer and long hot days that I may as well try to welcome in the colder seasons in style and use it to help me get excited about being able to wear cuddly winter clothes (especially since I am never excited about the drop in temperature. Not. Ever.). In fact more often than not there is vintage or homemade hats and gorgeous gloves present for this event too. It is usually really really cold at Dawn in April after all! I’ve only attended ANZAC Day dawn service since I met the FFA (fabric folding assistant/husband) but I have to say as much as we often complain about being frozen and sleepy it is always a moving experience – if you’ve never been to a dawn service you should go even just once! 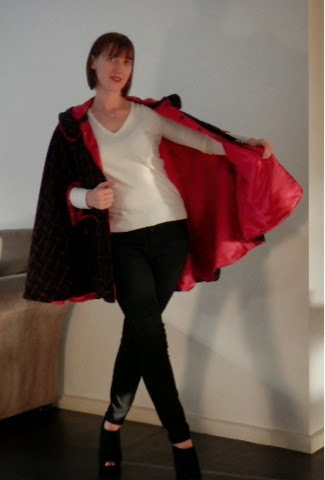 This cape has been a long time coming – like a year or more really…I started out great guns planning to wear this to last years dawn service, then I decided to add a lining to the unlined pattern…and realized I didn’t know how to sew welts…and that I didn’t have just the right buttons…so for these and other reasons this cape languished through last Winter and Summer while I accumulated supplies like lining and buttons and gathered up the courage to start in on those welts. I seriously think I watched a feature film’s worth of youtube tutorials on welt making gearing up to finally stitch those buggers! Part of the problem was that I loved the fabric so much – it’s some sort of wool-look-alike poly blend from Spotlight which works for me, since most real wool like this would just make me itch and this doesn’t! So of course loving the fabric meant it had to sit and wait until I had moved out of the honeymoon-phase of fabric love and into the more practical, real-world love phase where it was ok to cut into this glorious fabric, even if what I made wasn’t perfect *gasps in horror*! 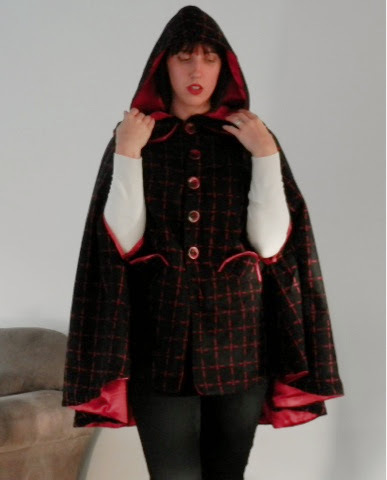 The pattern is McCalls M6446 and I will admit that part of the appeal of a cape was 1) Not having to fit it like a normal garment, if it went over my head that was great! This turned out to be a good thing since I am definitely a different size/shape now compared to when I started sewing this project. 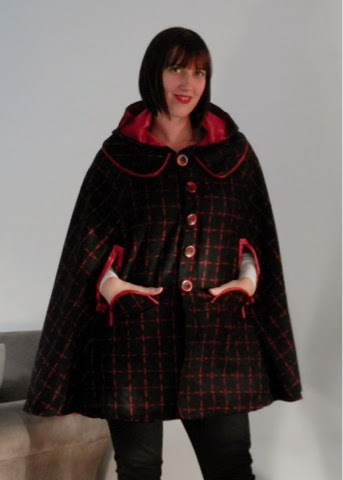 2) I love the vintage feel of capes with big welts for your hands. 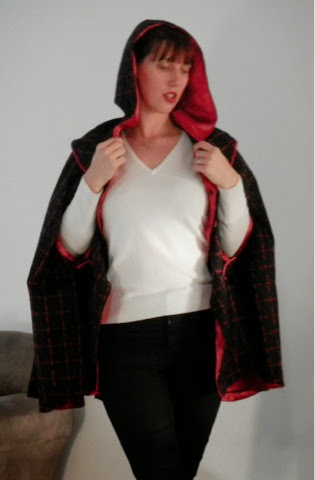 Also this means I can pretend I am Little Red Riding Hood for no good reason… See attached photos if you don’t believe me hehehe 3) If it is really cold I can pull my arms inside the body of the cape and really huddle for warmth! Ditto wearing like 10 layers under here and still looking chic! 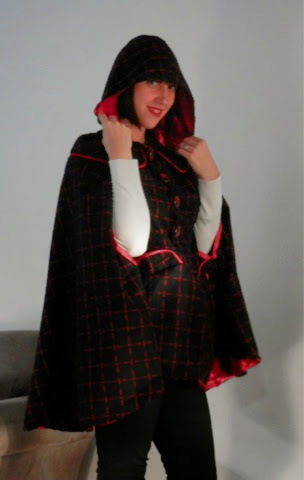 I made a standard size 10 and am happy with the fit – there is ALOT of fabric in this cape but the shoulder darts really help control the fall of the fabric. 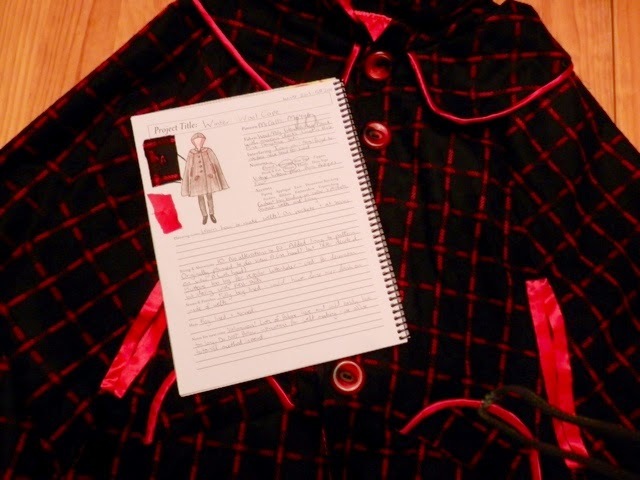 The edges of the collar and pocket flanges are covered with satin bias binding from Spotlight that conveniently matched the gorgeous rose red/pink colour of the checks. 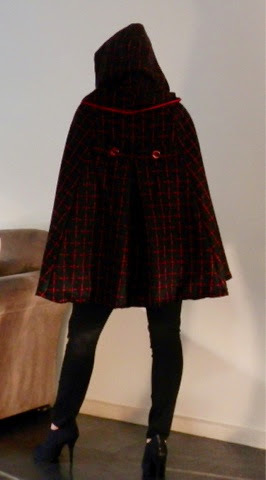 I actually bought this stuff back when I bought the fabric and pattern and was intending to make an unlined cape. Then I decided to match the lining satin to the bias binding and had a massive struggle finding a similar colour – DK Fabrics eventually came to my rescue! The only 2 things that lets this make down for me is that I should have made bound buttonholes since the vintage buttons I bought at the Burra Antiques Fair were so huuuge that my automatic buttonhole foot can’t make buttonholes big enough for them! Since I only discovered this right at the end of this project my solution was to add black press studs instead and sew on the buttons for decoration. 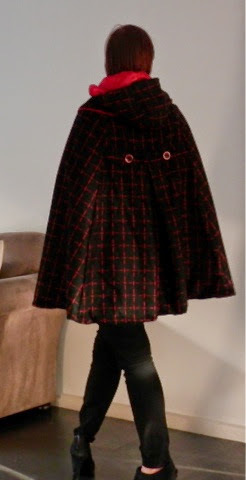 I actually really like the studs now since this cape is quick and easy to get off and on with minimal fussing. The other point is that because it took me so long to get through this project the addition of the lining wasn’t planned very well. 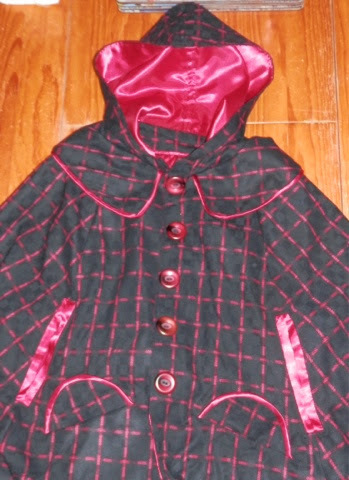 I have only made a lined jacket once before and that was simple to follow the pattern. Since I added my own lining the hems are just stitched and turned on this and the edges of the big welts are not stitched down very evenly at all. I’m actually considering unpicking this and re-stitching it again but I’ll wait and see if I can be bothered first – I was so excited to finally be able to wear this beauty I rushed through this finishing step so I could wear it sooner! I think this will get quite a bit of wear this year – it’s very very comfy and warm but still looks like I made an effort so I’m sure it will go on rotation in my wardrobe as Winter hits. P.S – check out the new shoes! I’ve been looking for some black shoe/boots with peeptoes for ages and finally found a pair. Yay for new shoes! Previous Post Me Made May 2014!